Starting a business in most states in the US is easy — fill out some paperwork, pay a processing fee, and boom, you’re a business owner. But what about starting a brand? Sooner or later, some of these choices will concern branding. That is, the way in which your business is presented to the public, from the colors in your logo, to the tone in your advertising, to the decor of your work space. You already know that for you, personally, it’s important to make good first impressions, and the same notion extends to your business. An effective brand strategy is one that considers who your target demographic is, what their needs are, who you are, and what makes your offer unique — Your brand should convey, to the broadest part of your audience, the value of starting a professional relationship with you! As a graphic designer, I’ve seen many entrepreneurs make the fatal flaw of discounting their audience when conceptualizing their branding. A favorite sports team’s colors for a wedding photographer, a caricature of an astronaut on a riding lawnmower for a handyman service, a sunset beach landscape for a metal shop: These are all things that I’ve been asked to incorporate into branding, but advised against, for being poor contextual fits for the business. The results (while pleasing to my client) were probably confusing to their clients, who wouldn’t understand the personal references being made. Ultimately, none of these businesses exist anymore, at least in part due to branding that did not connect with the target audience. The takeaway here is that choosing colors, concepts, and images that represent you is the right path, but not if the final product alienates or confuses your audience. Your branding and marketing is how you’ll entice people to begin working with you, so you need to speak their language. This may sound like a delicate balancing act, but even literal tightrope-walkers have to start somewhere! My advice is, instead of trying to tell your whole story in a single visual mark, think of who you most want to work with, and the most important thing about you that they should know. It might be helpful to visualize a conversation you might have with them, that would lead to a lasting and mutually successful partnership. What values and ideals do you convey? What is your tone of voice, your volume? In what ways does your conversation benefit your hypothetical ideal client? More often than not, this exercise sheds light on several strong, foundational concepts for a successful branding effort. So, you’ve considered yourself and your audience, what do you do next? Perhaps it’s best to start simply, by considering color. You may have some imagery in mind already, be it objective (depicting an easily-recognizable object that exists in reality) or abstract (depicting a basic design element that represents a broad idea, mood, or feeling) — In any case, it’s important to know that the human mind can perceive color and formulate emotional responses well before processing the imagery, text, and meaning behind a logo. How do you want your potential clients to feel when they consider your product or service? Color will set the mood, and solidify the ideas behind the imagery and aesthetic style of your brand. 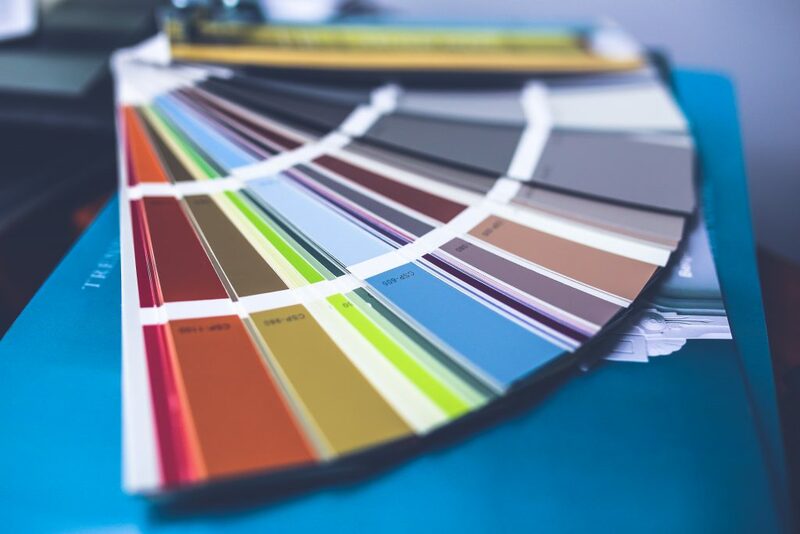 Now that you know that colors have common, preconceived meanings, think about which of those meanings are most closely tied to the work you do, and to the results your clients will expect from you. 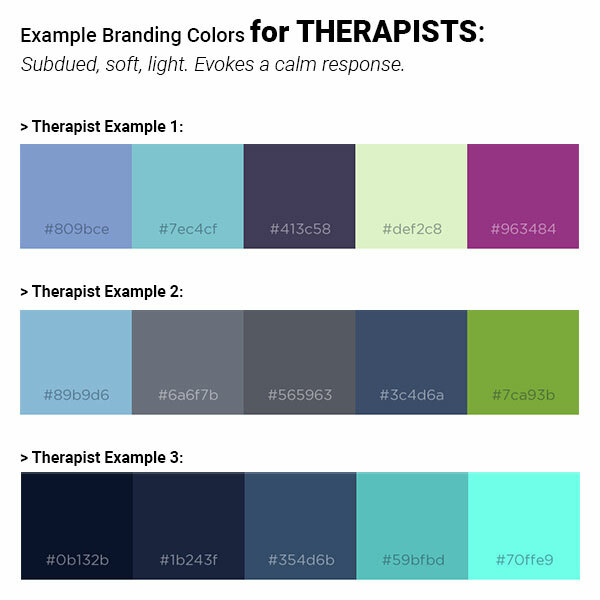 For therapists, for example; greens, blues, and purples are popular colors, because they broadly evoke calm emotional responses, which are conducive to establishing the trust needed to start just such an ongoing professional and personal relationship. Therapists tend to use light, pastel, or watercolor tones, because the inclusion of white suggests purity of cause, medical care, and a soft touch. 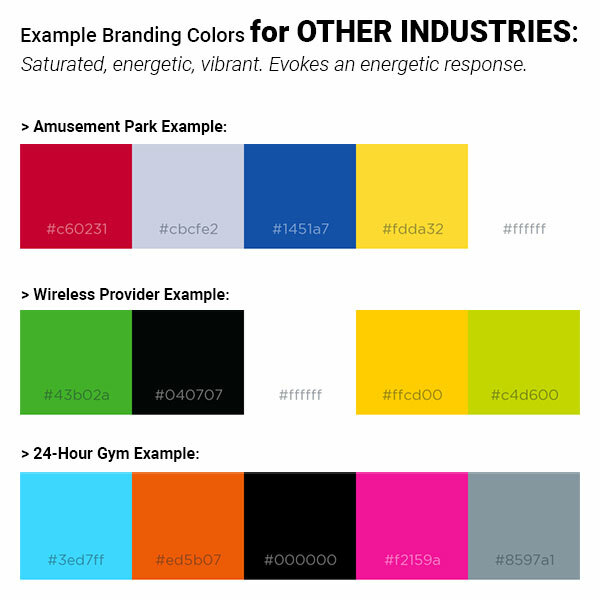 These same colors probably wouldn’t work very well for, say, an amusement park or a 24-hour gym — Warmer hues like red and yellow, and more vivid and saturated values, would go farther to convey the energy and excitement inherent in those entities. Monochromatic: Colors in the same “slice” of the color wheel, shades (darker) or tints (lighter) of the same hue. Examples include grayscale, or multiple values of any single color. Analogous: Colors immediately next to each other on the color wheel. Examples include red/orange/yellow, or blue/purple. Complementary: Colors directly across from each other on the color wheel. Examples include blue/orange (very popular in movie posters), or red/green. It’s a lot to take in, I know — And we’ve just covered the basics of a discipline that takes years to teach in universities all around the world. This article is meant not as an all-inclusive guide to building your own effective brand campaign from scratch (it’d have to be a lot longer! 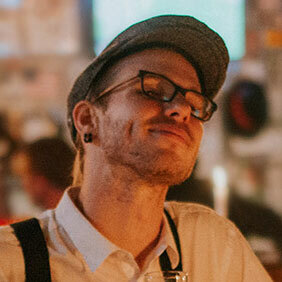 ), but rather as a peek inside the mind of your professional graphic designer. These are just some of the things they will be considering when they work with you to portray your business in the best light possible. By understanding the process better yourself, you are formulating organized and meaningful decisions that will help your designer understand what makes you special, and how best to convey that to your clients. And for that, you, your designer, and your clients will all reap the rewards! 15+ years of professional Graphic Design and Web Development.